Turn the key towards the rear of the vehicle to lock the vehicle completely. Press the closed padlock to lock the vehicle completely. 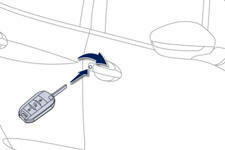 Maintaining the locking action (key or remote control) automatically closes the windows. Locking is confirmed by fixed lighting of the direction indicators for approximately two seconds. According to version, the door mirrors fold at the same time. As a safety measure (children on board), never leave the vehicle without taking your key, even for a short period. If one of the doors or the boot is still open or if an electronic key has been left inside the vehicle, the central locking does not take place. When the vehicle is locked, if it is unlocked inadvertently, it will relock automatically after about thirty seconds unless a door is opened. The folding and unfolding of the door mirrors by the remote control can be deactivated by a PEUGEOT dealer or a qualified workshop.